Not to be confused with Super Mario Bros.: Mario Mania!. 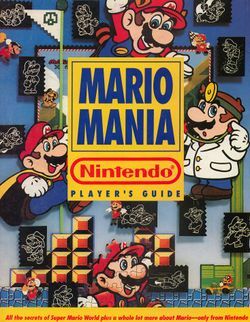 In addition, at the end of each world's section in the Super Mario World guide are trivia sections titled "Super Mariology", listing facts about the Mario games, such as how fast Mario can run and swim, and the farthest he can go in a single jump, as well as showing the graphical evolution of Mario, the Princess, and Bowser, and a brief description of Super Mario Bros.: The Lost Levels. On the page about The Adventures of Super Mario Bros. 3, one of the pictures is given the caption, "In Brooklyn, Mario and Luigi became babies for a second time," referring to the episode "Toddler Terrors of Time Travel". However, the picture in question is actually from "Recycled Koopa". The blurb about the Super Mario Bros. movie mentions Luigi being in love with a character named Dianna, indicating that this was Daisy's name at one point during the film's development. The interview with Shigeru Miyamoto transcribed in this book contains another prediction - specifically, Miyamoto's quote "Who knows how Mario will look in the future? Maybe he'll wear metallic clothes!" Five years later, Super Mario 64 would feature the debut of Metal Mario. This page was last edited on October 20, 2018, at 11:24.